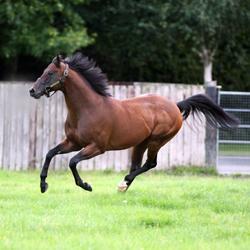 Five Winners and Counting for First Season Sire Haatef. Derrinstown Stud’s First Season Sire Haatef recorded his fifth individual winning 2yo when Haatefina scored for her owner Ushers Court, trainer Mark Usher and breeder Richard Tucker on the 18th of July 2012. Haatefina is out of the Caerleon mare Felona and was sold in the Doncaster St Ledger Festival Yearling Sale for £7,500. Mark Usher, Haatefina’s trainer thinks that she will stay a mile and will now be aimed at a Nursey. Bred by Brian Kennedy, Hasopop is out the Ela-Mana-Mou mare Convenience. His trainer, Marco Botti expects him to step up in class again on his next run.